If you are looking for a small, secluded paradise with stunning beaches, pine-forested scenery, pretty harbours, and a cosmopolitan capital, then Skiathos is your ideal holiday hotspot. 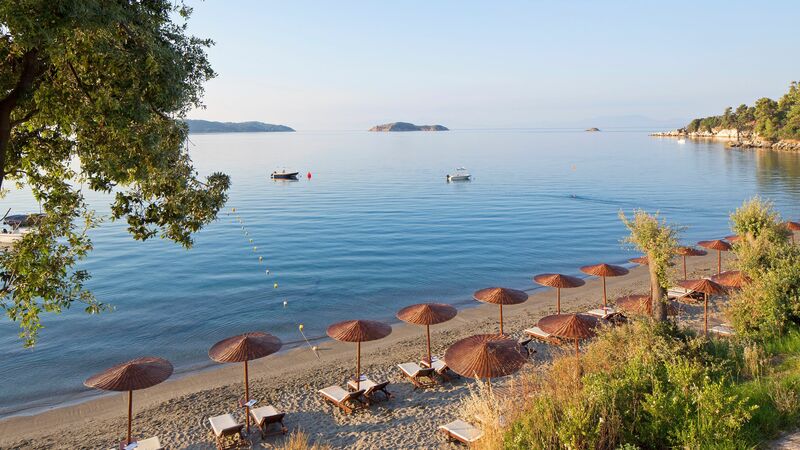 Nestled in the north-west Aegean, it’s the perfect place for families looking to spend special beach time together, or couples looking for a tranquil and romantic getaway in the sun. Clear blue waves border the spectacular beaches offering the ideal ingredients for swimming, snorkelling, and an array of watersports. Koukounaries is a popular beach on the island, backed by an aromatic pine forest while Lalaria is a hidden treasure accessible only by boat where gleaming white pebbles are bordered by clear, azure waters. History buffs will enjoy a visit to Kounistras Monastery, as well as the abandoned medieval town of Kastro, where you can enjoy an insight into the island’s inspiring history. Shopaholics will find everything they need in Skiathos Town with chic boutiques nestled alongside tourist shops full of souvenirs and gift ideas. Grilled sardines and lamb kleftiko are popular dishes at the waterside eateries and authentic tavernas on the island, and are perfect washed down with a glass of ouzo or locally produced wine. Megali Ammos provides a slice of authentic Greek island life, offering a sweeping bay and a few traditional Greek tavernas. Skiathos Town, the island capital, features white washed buildings and two swanky harbours full of priceless yachts, in addition to designer shopping and gourmet eateries serving fresh seafood and traditional Skiathos meze. 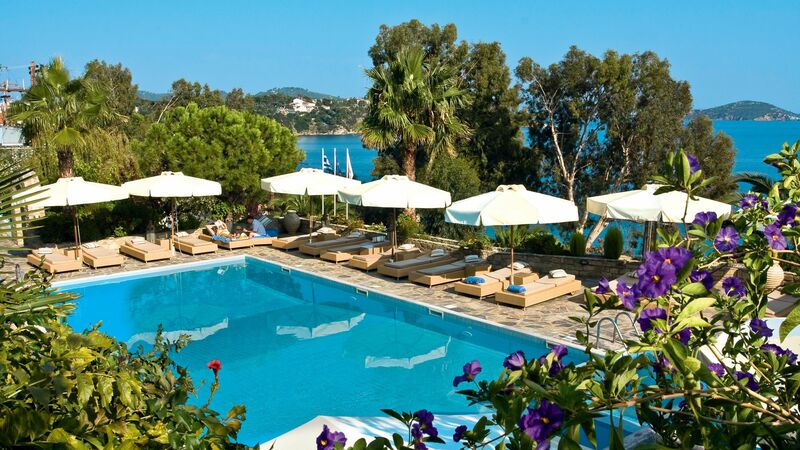 Sample the town’s historic delights, including the castle remains, and the swanky clubs and bars before sitting by the waterside with a cocktail and watching the mesmerising Skiathos sunset. Seaside villages, like Agia Paraskevi are sprinkled along the south coast of Skiathos, offering private coves and small resorts, while the north coast offers more rugged and less developed resorts, just right for escaping and getting away from it all. Enjoy horse riding through the countryside or take a drive around the island and admire quaint churches and monasteries dotted throughout the picturesque villages. Experience life away from the crowds and visit Vasilias Beach, which is covered by pine forests and olive trees to allow you to experience all the nature Skiathos has to offer. I love the island because it’s quite small and very easy to get around – you can travel from one end to the other on the local bus and this would only take 20-30 minutes. You could also hire a 4x4 and explore some of the tracks leading off from the main road, where you’ll find some unspoilt beaches, little churches and monasteries (the views are breathtaking, too). Ferries and boat tours putter between Skiathos Town harbour and the neighbouring island of Skopelos. Start your island tour by wandering the cobbled streets and past the seaside tavernas of Skopelos Town. Next, make a beeline for one of the pine-backed sandy beaches (we recommend Koukounaries or Maratha), before popping by one of the whitewashed villages. Boat tours often stop off at the island of Alonissos as well, which is part of the biggest protected marine park in Europe. It shelters everything from historical shipwrecks to silver seals. The 18th-century Evangelistria Monastery sits on a hillside, surrounded by pines and fir trees. It looks more like a castle than a monastery, with round towers and a Venetian-style terracotta roof. Head inside to peruse exhibits of rare holy books and manuscripts, plus Byzantine icons and silver crosses. The real highlight, though, is the chance to buy honey and wine made by the resident monks. You can drive to the Evangelistria Monastery or get the bus from Skiathos Town. Alternatively, tackle the uphill hike – it takes about an hour from Skiathos Town. Once upon a time, the clifftop medieval town of Kastro was the biggest settlement on Skiathos. These days, it’s in ruins, having been abandoned 200 years ago. Boat trips take you to the beach below, where a footpath clambers up the cliff to the top. The steep half-hour climb is worth it, though – Old Kastro gives up wide sea views over the dramatic scalloped coastline. If an uphill hike isn’t your cup of tea, then opt for a 4x4 tour to Old Kastro – it’ll take you right up to the clifftop carpark. Agia Paraskevi is like a picture postcard of the Skiathos coast. The gold-sand beach comes with a backdrop of trees and terracotta-roofed hotels, plus there’s another beach – Kolios – next door. The resort of Megali Ammos rolls up next to Skiathos Town. The beach is the star of the show here – a miles-long stretch of sand, sunloungers and watersports shacks. 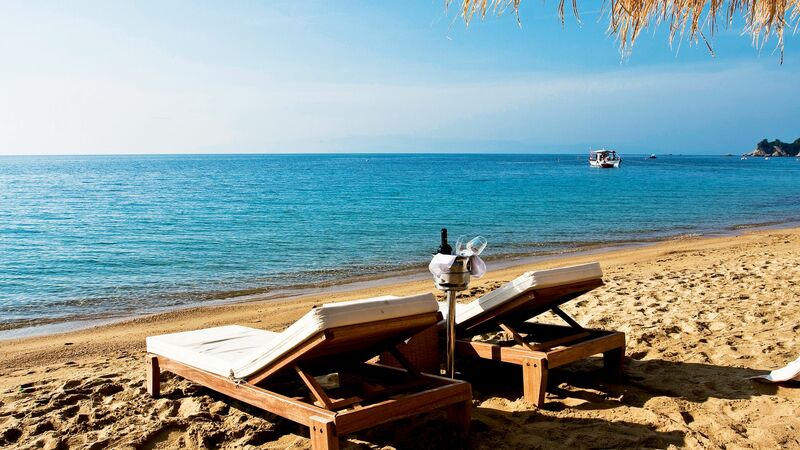 Vasilias Beach is a little resort near Skiathos Town. The hotels take cover among the pine forests and olive groves in the hills behind, so it’s got a relaxed feel. You’ll find classic Greek cuisine in Skiathos, with seasonal menus bursting with locally grown veg, cheese and fruit. Skiathos’ coast is packed with waterfront tavernas serving fresh seafood, typically chargrilled whole with a light marinade of olive oil and lemon juice. If you’re on the lookout for traditional Skiathos dishes, must-tries include the island’s take on hortopita, a hearty pie filled with spinach, herbs and feta.